Now in its sixth edition, A Wing and A Prayer is a story that is often compared to such works as Jonathon Livingston Seagull, Watership Down, and The Jungle Books. Published by Grey Gecko Press in a special 25th Anniversary Edition with illustrations by artist Sarah Anderson, features an introduction by John Sawhill, President and CEO Emeritus of The Nature Conservancy, and a companion Introduction by Mark Tercek, the current President and CEO of The Nature Conservancy. Lupe believes he is the last Guadalupe Petrel alive, and he just might be. His biggest problem is that a man-flock has decided to save him by locking him in a cage. Lupe knows the only way he can save his flock is to find a female, so he plots his escape to search for the Islands of Life. Written in a very Disneyesque style, A Wing and A Prayer will make you smile, laugh out loud, and in the end it will leave you with a lasting warmth. Yet while all this happens, Morano manages to take you to strange places; introduce you to wonderful characters; and discuss themes like religion, feminism, race relations, and environmental concerns. Now in its fourth edition, the 15th Anniversary Edition of Makoona features an introduction by Kathryn Fuller, Director Emerita of World Wildlife Fund, and wonderful illustrations by artist Sarah Anderson. 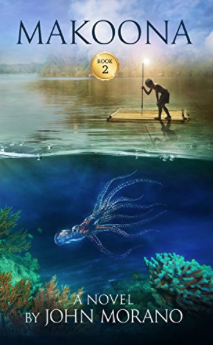 Welcome to the inspiring story of Binti, a female octopus who lives in the Makoona coral reef, and Kemar, a Cambodian refugee-boy who fishes the reef. As a mollusk without a shell, Binti believes she’s missing something...but the reef is a dangerous place to search for anything, let alone the shell that will fulfill her and enable her to communicate with the spirit-fish. Helped by her friends and a psychedelic octopus who speaks Grateful Dead lyrics (with the band’s permission! ), the search is on. Fifteen-year-old Kemar, a boatperson fleeing the Khmer Rouge, fishes the waters around Makoona where he crosses the path of a strange octopus and befriends both a Vietnam vet and an old American mechanic who claims she was once a world famous aviator. Out There, Somewhere is in its third printing with an introduction written by Roger Rufe, President and CEO of Ocean Conservancy, and beautiful illustrations by artist Sarah Anderson. Morano sets his third eco-adventure in SeaTopia, a large aquarium built on a Florida beach. The story traces the lives of several residents; a dolphin family, a turtle, a stargazer, an angelfish, a manatee, an octopus and a coelacanth, among others... How they came to SeaTopia, what they’ve left behind, what their daily life in a tank is like and what their hopes are for tomorrow, are all discussed through the course of the story. The director of the aquarium, several staff members, a special little girl and a group of biologists very interested in the captured coelacanth also play important roles in the book. Expect to see two or three characters from previous novels return in Out There, Somewhere. Gilgongo from A Wing and A Prayer and a young octopus who remembers life on Makoona might make an appearance. Perhaps there will also be a human visitor from Makoona. The fourth book in the Eco-Adventure Series brings Lupe’, Zomis, Kemar, Stithl, and other characters from previous books back to print; while introducing new main characters like Azul, a Spix’s Macaw, Gonzo, an Ivory-billed Woodpecker, a ruby-throated hummingbird named Thrice, and Bardus, a barred owl who only speaks lines from The Bard, Shakespeare. Flocks of One transports readers to incredible habitats like the Caatinga of Brazil, the Galapagos Islands, and the Pine Barrens of New Jersey, among other fascinating wild places. An action-packed story that deals with some of the planet’s most highly endangered creatures, Flocks of One is currently available on Kindle and is scheduled to be released by Grey Gecko Press in its debut edition soon.